Whole Wheat Pita Bread by Mr. Pita. I usually find this on the top shelf with the other breads. Iron Chef Orange Sauce - Do you like the orange chicken at Panda Express, this is a similar orange sauce and can be used on vegetables, rice, potatos or anything else you want to try it with. I really enjoy it as a stir fry sauce! Kikkoman Stir Fry Sauce - Found with the other teriyaki and stir fry sauces. Make sure you only get the one with the green label. No oil or high fructose corn syrup! Smuckers Simply Fruit - Jelly/jam. Found with the other jellies and jams. Original Bulls Eye BBQ sauce. Make sure to get the original and make sure there is no high fructose corn syrup. The label in the picture is actually torn and says "no high fructose corn syrup" (the "no" is torn and missing). SmartDogs - Vegan hot dog which is a close to the real thing as possible. Great for chili dogs, bbq-ing or on a whole wheat hotdog bun with mustard and relish (make sure the relish does not have high fructose corn syrup). 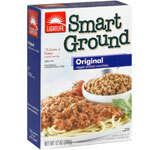 These are usually found my the bagged salads in the produce section. 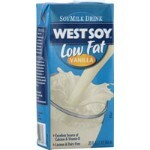 Westsoy Soy Milk - This comes in several varietes and is NOT in the refrigerated section. It is in a normal aisle and you may have to ask to find out where exactly it is. I've seen it in different locations depending on the store. My favorite is the non-fat vanilla flavored in a purple box.